I'm a journalist with BBC News, specialising in data-driven journalism, finding stories from complex datasets and visualising them online. I have been editorial lead on a number of very successful and award-winning BBC projects. You can get in touch by email at [email protected] or through any of the social media platforms below. Falling through the gender pay gap: A 'scrollytelling' experience showing how the gender pay gap measures up at more than 10,000 companies in the UK, with animations and visualisations changing on scroll. Things I did: Contributed to the data analysis and visualisation of the BBC data team reporting of gender pay gap results, using R, and worked on the production of this particular page. The BBC's R package and cookbook for making graphics: The BBC data team open sourced the code we use for making static visualisations, as well as publishing sample code and how-tos. Things I did: Played a leading role in writing the code for the R package and cookbook, as well as documenting the process and sharing what we learnt. Also developed the internal R course described in the post. What's your diet's carbon footprint? Food production is responsible for a quarter of all greenhouse gas emissions. We looked at the impact of what you eat and drink on the climate. Things I did: Developed idea, project management and development, data wrangling and analysis using R, writing and reporting the story and worked with colleagues on the visualisations produced for the page. Mapping the 2018 US midterm elections: A BBC data team analysis of a dramatic election night, visualising how the political geography in the US has shifted and what this means. Things I did: Worked with colleagues to prepare R scripts for generating election graphics, cleaning and interprating election data as well as writing and reporting on the day. Inspired by some beautiful New York Times maps of the USA visualising urban footprints, I made some maps of London, one showing its buildings and the other its green spaces. Things I did: Styled up and visualised geographical data for every building in London using mapping software QGIS, exporting the map in high resolution for printing. Where does rent hit young people the hardest in Britain? Looked at where people in their 20s who face paying more than a third of their salary to rent a place for themselves. Things I did: Worked on the interactive map, doing the technical work to generate a BBC-style mapping tile basemap from the Ordnance Survey's map data. How chemical weapons have helped bring Assad close to victory: A joint BBC Panorama and BBC Arabic investigation on how chemical weapons have been used in Syria's war. Things I did: Worked on the interactive map and the timeline calendar graphic in this story. Used Excel to clean data, Carto for the animated map and d3.js for the calendar visualisation. As hurricane Florence bore down on the East coast of the United States, we visualised the storm's predicted path and its expected rainfall, using maps and satellite imagery to tell the story. Things I did: Wrote an R script to automate the download of high resolution GOES satellite imagery, used in the story and to create an animation. Used QGIS to produce a map of projected rainfall. All you need to know about penalty shootouts: What makes the perfect kick? Who has the best record? And does luck really come into it? We visualised the history of World Cup shootouts. Things I did: Analysed penalty shootout data from Opta, wrote and produced the story and created all the graphics using R and ggplot2 from start to finish. How important is home advantage? Which Mexican defender has the same World Cup scoring record as Cristiano Ronaldo? Seven data visualisations about the World Cup. Things I did: Story idea and planning and managed the project editorially. Analysed and visualised World Cup data in R, using the ggsoccer package to create the shot maps. Nine facts about how long we live: Women outlive men in 195 countries and in Russia they do so by 11 years. Ethiopians are living 19 years longer than in 1990. Our story in charts. Things I did: Data analysis, story planning and production, project management and coordinating with the BBC's language services and creating graphics from start to finish in R using ggplot2. How many £1m-plus homes are sold near you? : We look at the areas in England and Wales with most residential property sales for £1m or more in the past decade. Things I did: Came up with the story idea and concept and carried out some data analysis. Worked with colleagues to develop a new type of interactive search module for the story. Explaining complex news stories to less engaged audiences. Part of a BBC team that won the "World Cup of Newsroom Innovation" with 'Appy Helper', an in-article chatbot to help readers. Things I did: Editorial lead of the winning team at the Global Editors Network hackathon. Our prototype has since been developed into a BBC product and featured in numerous stories. How much property is owned offshore? Investigation into UK property owned overseas, highlighting concerns that companies registered in British-controlled tax havens are used to avoid tax. Things I did: Story idea and planning. Wrote R scripts to clean and analyse the data, as well as geocoding the locations to build an interactive map. Have house prices actually gone up in your neighbourhood? Deep dive into house prices since the 2007 crisis, analysing 8 million transactions. Received a Royal Statistical Society award. Things I did: Story planning, reporting, data analysis and production. Used R to clean and analyse a dataset containing all residential property transactions in England and Wales since 2007. Is anything left of Mosul? : Collaborated with colleagues to show, using maps and graphics, the widespread destruction of the Iraqi city following the brutal fight against ISIS. Things I did: Worked on the story concept and planning, collated data and carried out data analysis and some map-making. Used in-house map-making tools and QGIS. Will coffee taste worse as the planet warms? A feature examining the impact that climate change could have on coffee, both in terms of quality and price. Things I did: Story planning, writing and reporting, data analysis, map-making and production. Used Excel, QGIS and processed Landsat satellite imagery using command line tools. Six reasons Trump’s wall may not actually get built: Worked with a colleague to look at the obstacles President Trump will have to dodge to build a cross-country barrier. Things I did: Data extraction, analysis and map-making. Used R to scrape online data, used QGIS and GDAL to make maps and processed Landsat satellite imagery with command line tools. 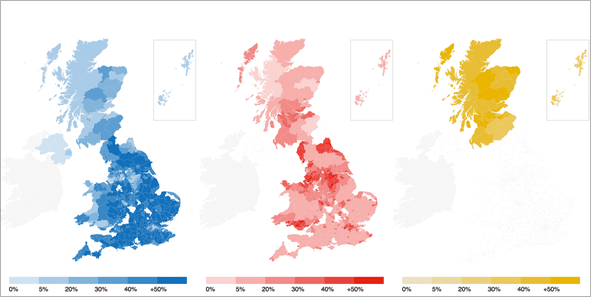 The 2017 UK general election in graphics: A BBC data team analysis of a stunning general election looking at how the UK's political geography has changed. Things I did: Story planning, reporting, data analysis and map-making. Used R to write scripts to clean and analyse election result data and QGIS to produce maps. Who is your Olympic body match? Interactive calculator where by entering their height, weight and age, users can find out which athlete taking part in Rio 2016 they are most like. Things I did: Story planning, editorial management and data analysis. Used R to write scripts to explore, query and test the Olympic athelete dataset. The untold story of Europe's drowned migrants: A BBC investigation quantifying the number of people who died crossing the Mediterranean and buried in unmarked graves. Things I did: Story planning, reporting, data journalism, map-making and project management. Used Excel, QGIS, GDAL and processed Landsat satellite imagery using command line tools. Life and death in Syria: What life is like for the millions who live in the country five years into a devastating war. Won best data vis at the European Digital Media Awards 2017. Things I did: Story planning, reporting, data analysis and visualisation for two of the five sections of this story. Mainly used Excel for any data analysis. Interactive calculator where users can find out the likelihood of their job becoming automated. Project Featured in the 'Hello, Robot.' exhibition at the MAK museum in Vienna. Things I did: Story planning, writing, data analysis and project management. Used a combination of Excel and R for data analysis. How bad are things for the people of Greece? Feature a colleague and I worked on looking at how the ongoing recession is affecting the lives of the people in Greece. Things I did: Story planning, writing, reporting and interviewing, data analysis and visualisation. How long would it take to earn a footballer’s salary? Interactive page allowing users to compare their wages to those of global football stars. Won best data vis at the European Digital Media Awards 2016. Things I did: Story planning, writing and reporting, data analysis, unit testing, project management. Tracking a month of deadly attacks: BBC and Kings College London investigation mapping jihadist attacks in November 2014. Project won the Royal Statistical Society best data visualisation award. Things I did: Assisted senior journalist in the reporting, data journalism and map-making for this story. Used Excel and QGIS. How world’s worst Ebola outbreak began with one boy’s death: Visually-led story on how the Ebola outbreak that ravaged West Africa in 2014 started and spread. Things I did: Story planning, writing and reporting, data scraping, data cleaning and map-making. Used Excel, Tabula for PDF parsing, Open Refine for data cleaning and QGIS. European Parliament’s turnout problem in 3 charts: A feature with the FT's senior data journalist examining the democratic deficit of European Parliament elections ahead of the May 2015 vote. Things I did: Story planning, writing and data analysis. Mainly used Excel for analysis.